10/92 David Mumpower Darker than an eclipse...and I like it that way. 20/126 Kim Hollis Gripping socio-political commentary. Liev Schrieber deserves to be a much bigger star. 25/55 Reagen Sulewski Fantastic acting in this one (especially Meryl Streep) but it does suffer a bit in comparison to the original. The convention scenes are actually quite awful. 43/48 Les Winan Completely unnecessary. Particularly when built around Denzel playing the same character as in every other Denzel movie. I found one of my all-time favorite movies during the closing of the historic Key Theatre in Washington, D.C. During the final days of the city's last independent movie house, the theater owners showed films that had played over its 24 year history. The Manchurian Candidate intrigued me like few other movies had. The late John Frankenheimer directed a taut, suspenseful film. Knowing her only from her Murder, She Wrote years, I was astounded at the sinister and cunning Angela Lansbury played. Nor had I ever been a fan of Frank Sinatra, yet I thought he too was very effective as the hero. In Fall 2003, Paramount will begin production on a remake of the classic movie. 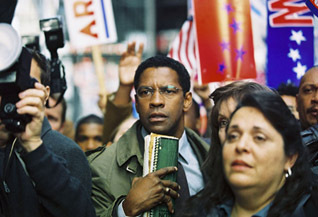 Meryl Streep, Denzel Washington and Liev Schriber reprise the roles of Lansbury, Sinatra, and Laurence Harvey. The new production will be updated to reflect modern times, yet the plot remains the same. Two soldiers serving in the Persian Gulf War (instead of the Korean War in the original) are kidnapped and brainwashed. The fates of the two are intertwined again years later against the backdrop of a political campaign. Jonathan Demme directs. After his high-profile turns at the helm of The Silence of the Lambs and Philadelphia, Demme's films have not fared well. He brought a remake of The Truth About Charlie to the screen in 2002, and even with Mark Wahlberg in the lead, the film brought in a paltry $5 million. His 1998 adpatation of Toni Morrison's Beloved, while critically praised, took in only $22 million at the box office. For The Manchurian Candidate, Demme will work from a script by screenwriter Daniel Pyne (Any Given Sunday, The Sum of All Fears).